The bunion splint is a lifesaver for those who have Bunion.These spacers use medical-grade silicone gel material ,safe and comfort. Bunion pads are helpful in stretching in all joint of the toes and relieve where the toe get locked up. Bunion relief pro bundle has such a variety of options to help ,there are many different brace things to keep the toes where their should ,and to alleviate discomfort from the rubbing against each other. Meanwhile,the splint medical bunion can fit fine regular size and is washable and reusable. Includes:3 packs-whole toe,big toe and little toe. 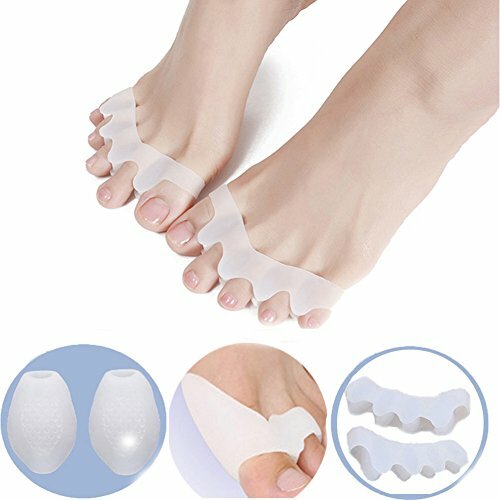 MATERIAL:Soft silicone gel bunion splint,so it won't hurt your toes when you wear it. RELIEF AND CORRECT :The bunion corrector and separator can relieve pain,improved circulation,re-align problem toes. FIT REGULAR SIZE:The bunion splint designed for both man and women to separate the hammer toe or bunions. WASHABLE AND REUSABLE:the bunion splint is washable,which can keep the personal hygine.